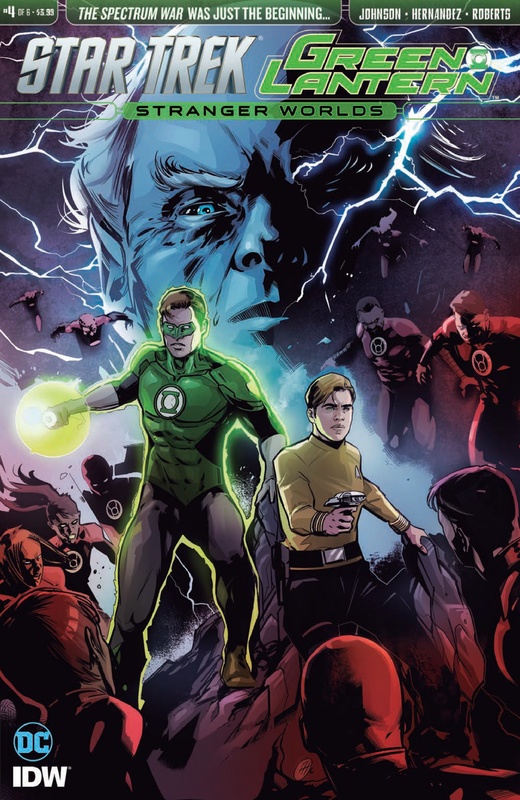 IDW and DC have returned with their fantastic run on Star Trek/Green Lantern. When we last left our story Kirk, Spock, and Hal Jordan were facing off with an extremely angry, red power ringed Kahn. The sequence is very tense and the outcome is very along the lines of how our heroes would cope with the situation. It’s super cool to see the Enterprise go up against a power ring. Kahn ends up finding his way to the Klingon home world and has a much bigger surprise in store. Meanwhile, our other resident evil Sinestro is causing his own brand of issues upon the unsuspecting Guardians. Sinestro just wants to power up and take over. I think the more interesting story will come when Sinestro and Kahn cross paths. Plus, I wonder what happens if Kahn upgrades his minions. The story is still really good. There are endless possibilities for each side of characters. It’s shame that this is only a 6 part series, because just as with the first crossover, only so many characters really get the time they properly deserve. With the limited space they have, they still make sure every scene counts for one hell of a story.